From the Departments of Ophthalmology (H.K.Y., J.-M.H. ), Neurology (J.-Y.C., K.S.P. ), and Radiology (J.H.K. ), Seoul National University College of Medicine, Seoul National University Bundang Hospital, Seongnam, South Korea. 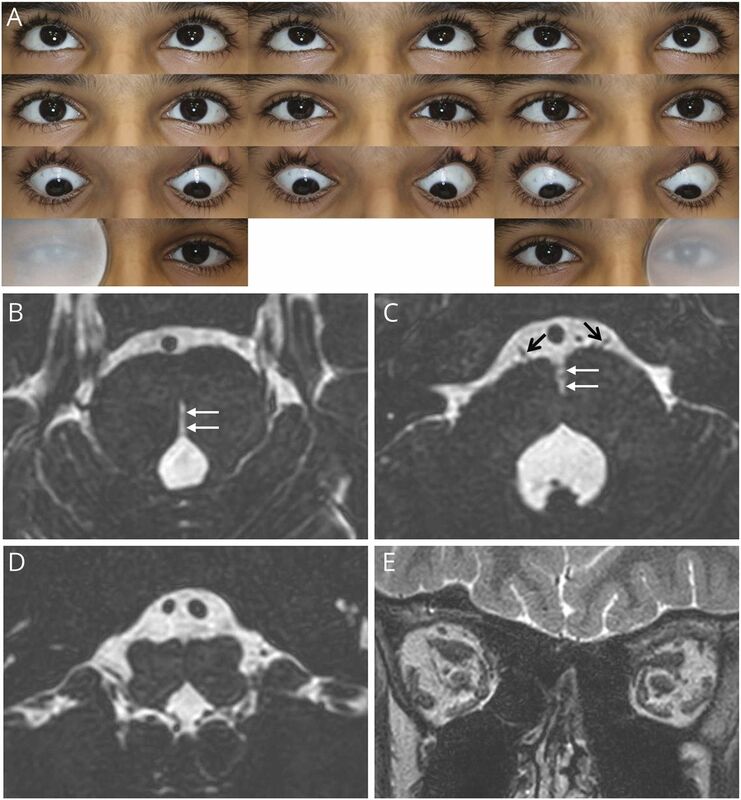 A 10-year-old girl presented with abnormal eye movement since birth. She was born from consanguineous parents. Ocular ductions showed complete horizontal gaze palsy, partial limitation of upgaze, and synergistic convergence (figure, A; video 1). Her pupils were round and isocoric. She showed severe thoracolumbar scoliosis. Uncrossed corticospinal and dorsal column–medial lemniscal pathways were demonstrated during intraoperative neuromonitoring of scoliosis surgery. Brain MRI revealed a bifid shape of the pons and medulla oblongata (figure, B–D), which is a typical finding of horizontal gaze palsy with progressive scoliosis.1,2 Bilateral oculomotor, trochlear, and abducens nerves were normally identified (figure, E). (A) Nine gaze photographs of the patient show horizontal gaze palsy. Both eyes show complete limitation of horizontal eye movements during right gaze (left column, second row) and left gaze (right column, second row). A partial limitation of upgaze is also noted (middle column, first row). (B, C) T2-weighted images show a bifid shape of the pons with a midline fissure (white arrows) at mid and lower levels. Both abducens nerves are normal (black arrows). (D) Butterfly shape of the upper level of medulla oblongata. (E) Normal extraocular muscles. Go to Neurology.org/N for full disclosures.
. Neurologic features of horizontal gaze palsy and progressive scoliosis with mutations in ROBO3. Neurology 2005;64:1196–1203.
. Mutations in a human ROBO gene disrupt hindbrain axon pathway crossing and morphogenesis. Science 2004;304:1509–1513.